Along with our sweet naming tradition, we also introduce a new device with each platform release to showcase the latest Android innovations. For KitKat, we partnered with LG to develop Nexus 5 — the slimmest and fastest Nexus phone ever made. Its design is simple and refined to showcase the 5” Full HD display. 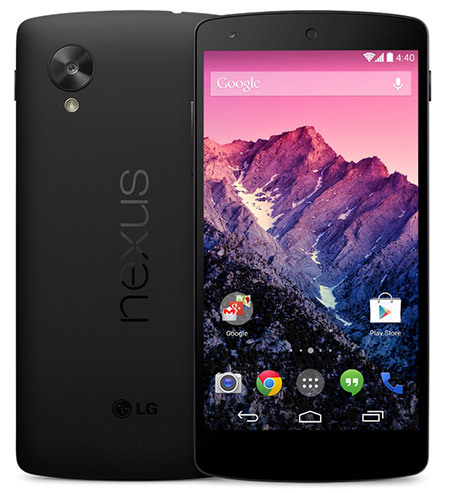 Nexus 5 also keeps you connected at blazing speeds with 4G/LTE and ultra fast wifi. The advanced new lens on Nexus 5 captures more light for brighter night and sharper action shots. And with optical image stabilization, you no longer have to worry about shaky hands and blurry pictures. A new HDR+ mode automatically snaps a rapid burst of photos and combines them to give you the best possible single shot. The advanced new lens on Nexus 5 captures more light for brighter night shots and sharper action shots. And with optical image stabilisation, you can stop worrying about shaky hands and blurry pictures. Better colours by day, less noise at night. The new HDR+ mode automatically snaps a rapid burst of photos and combines them to give you the best possible shot. Daytime shots are vivid with clean shadows, and night-time shots are sharp with less noise. Nexus 5 is precision-built from strong materials, and the intelligently simple design showcases more of what matters to you. At only 130 g and 8.59 mm thin, it’s the most powerful Nexus phone yet. With 4G/LTE and ultra-fast Wi-Fi, Nexus 5 keeps you connected at blazing speeds. Add in the cutting-edge 2.3 GHz Qualcomm Snapdragon™ 800 processor and you’ll race through games, zip around the web and switch between apps at the flick of a finger. More room to do what you do, and better colours too. Nexus 5 gives you a Full HD display so that you can see every detail in lifelike colour with less glare and a wider viewing angle – the perfect canvas for your moments. Android is fast and powerful, yet simple to use. Focus on getting stuff done, and having fun too, without having to think about the technology underneath.